Wow, sorry for the delay. Finally….. bandwidth. 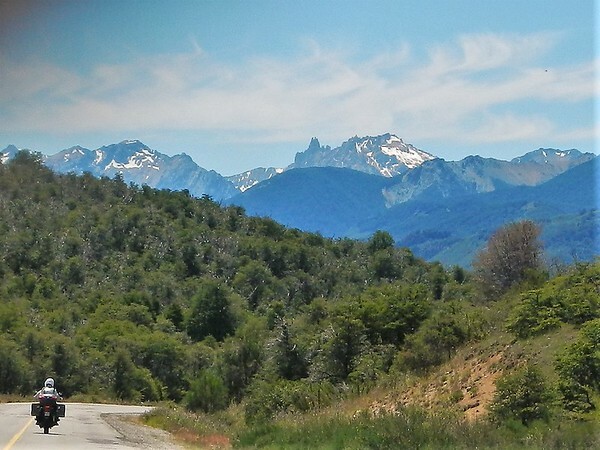 I’m writing this from Colhaique, Chile. We are here, and so far, safe and sound and having too much fun. Our route is the bottom magenta line. 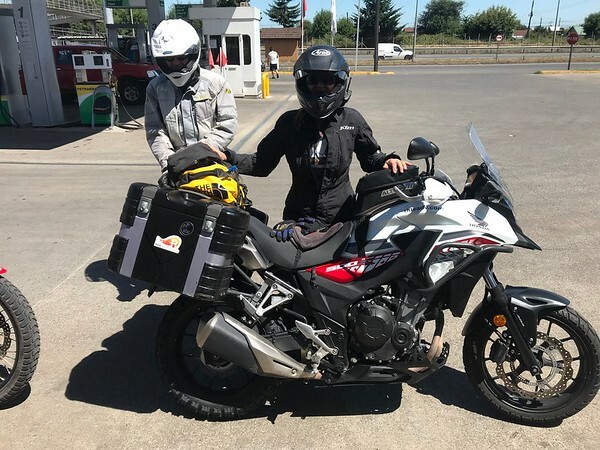 I’ll pick up where I left off with Michael and his wife Dee Dee riding two up on the Africa Twin. 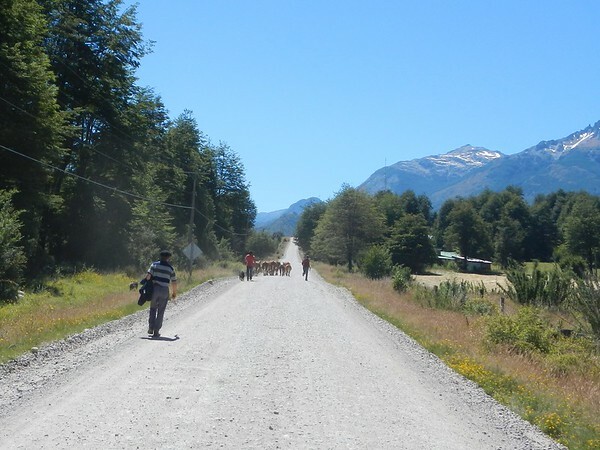 We left Chiaten for the south along the northern part of the famous Carretera Austral. It was another beautiful day for riding with nice roads and views behind. And nice views looking forward. Of course in some of the construction sites there were no flaggers and we just needed to dodge the construction vehicles. I should be riding with both hands but I wanted to get a picture using my camera in my left hand. Still, great riding with spectacular views and challenging but fun roads. We stopped along the way for a short break and to check on Dee Dee on the back of Michael’s bike. She was having a great time didn’t know I had my camera on while she shook out the stiffness in her legs. Go Dee Dee! More nice views along the road. We rolled into Trevelin about 4:30 and found a nice Cabana to rent with two bedrooms. As usual, one room had a double bed and the other had two singles. It was our turn for the single beds. I tried setting up on the picnic table outside to write a blog post but the internet was so bad I couldn’t even upload pictures so I gave up and we went into town to look for some food. 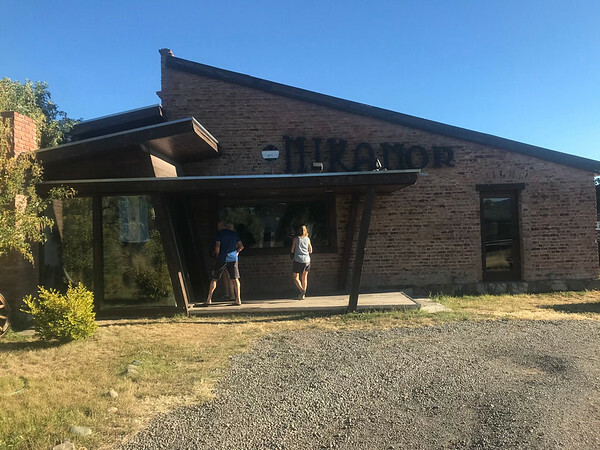 It was recommended that we checkout a place called Mikamor on the edge of town so we walked there and it looked not only closed but really abandoned. We walked back towards the hotel and asked about food at a few other small places we passed and were told they don’t open until 8:30. Hmm, dumb gringos wanting to eat at 6:30, what’s up with that? 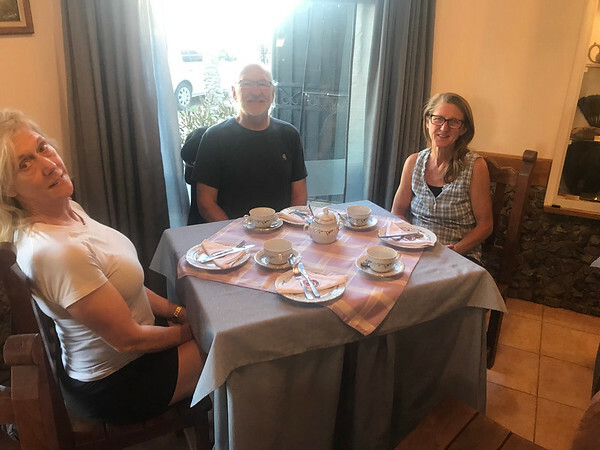 Hungary, we stopped into a Casa de Te, or tea house. We figured we could get a cup of tea or coffee and maybe a pastry to hold us over. Immediately we recognized this was a proper tea house and rather formal with cloth tablecloths and nice place settings. 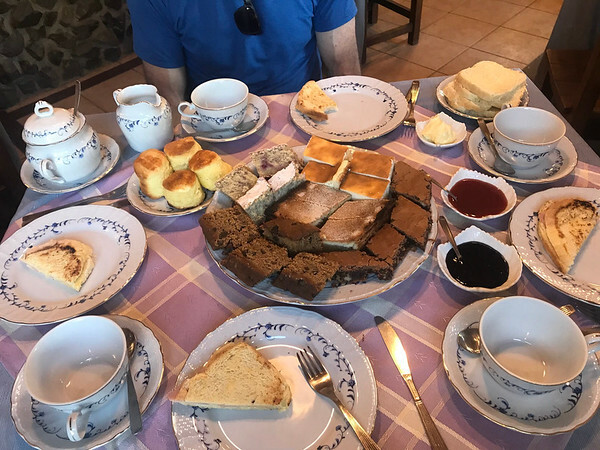 Somehow in the translation we determined they serve a plate of pastries for four with our coffee. Ok, sounds good, so we ordered that. A few minutes later this is what showed up. Wow, that was a small snack? We did our best but only put a dent in that plate and took the rest away carefully wrapped in a plastic bag. 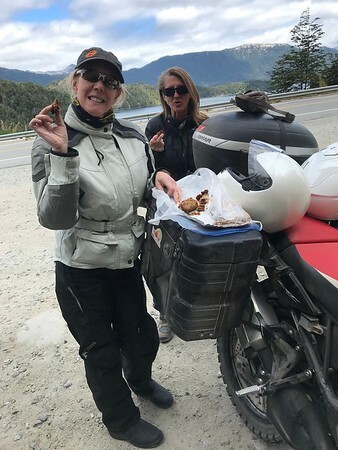 The brownies, apple kuchen, cream bars, some kind of raspberry bread lived in my pannier for the next few days and we snacked on them at gas stops. Needless to say we didn’t care about the restaurant any more. Before we got back to the hotel Michael and I went to the ATM at the bank to get some Argentinian pesos. Michael was busy looking at the receipt and didn’t pull his debit card out fast enough and it got sucked back into the machine. One card down. We got a relatively early start on another beautiful day. It was clear but a little cool so I started with my heated liner on low. No one else had theirs on so I guess I’m just the wimp of the bunch. Our first stop was the bank to see if we could get Michael’s card back. I didn’t think it was possible but went inside to help in case my slightly better Spanish skills would help. To our surprise after we took a number and waited a few minutes the teller reached in a drawer and pulled out his card. All Michael had to do is show his passport and we were on our way. Hmm, didn’t expect that, but glad it worked out. 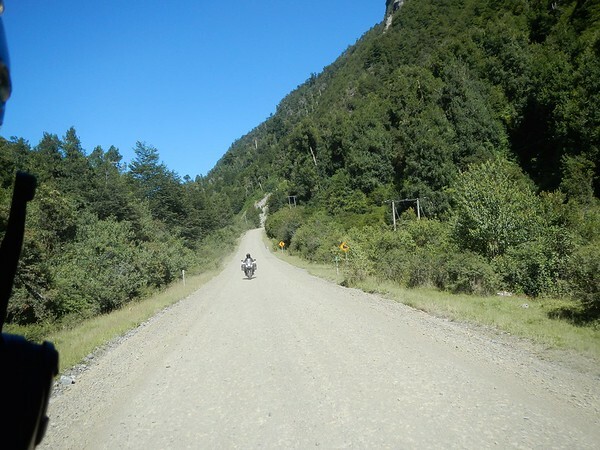 It was a easy day riding north to our destination of the resort city of San Carlos Bariloche. 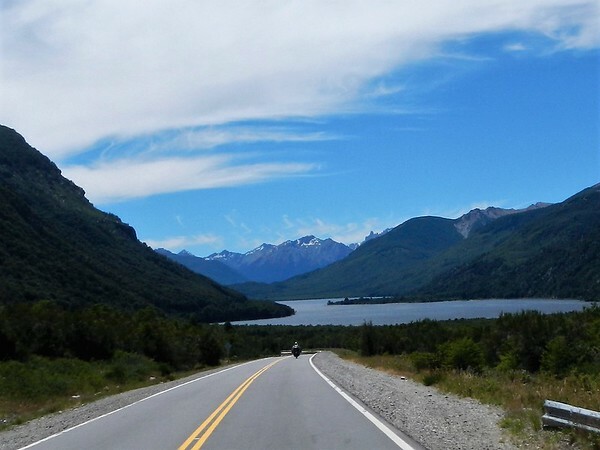 Easy paved roads all day and beautiful views of the jagged peaks of the Andes along with crystal blue water. 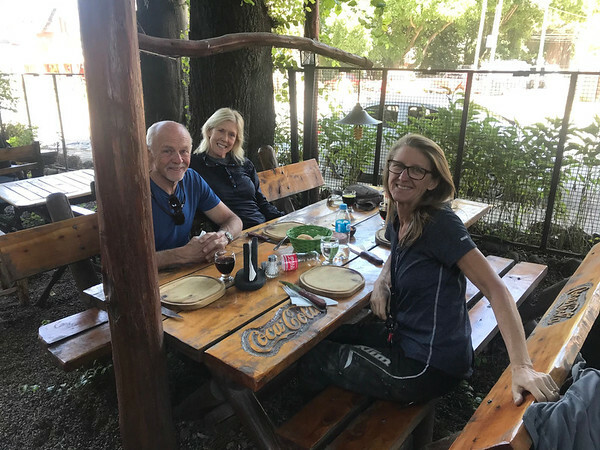 We stopped int eh small town of El Bolson and found a great place for lunch. 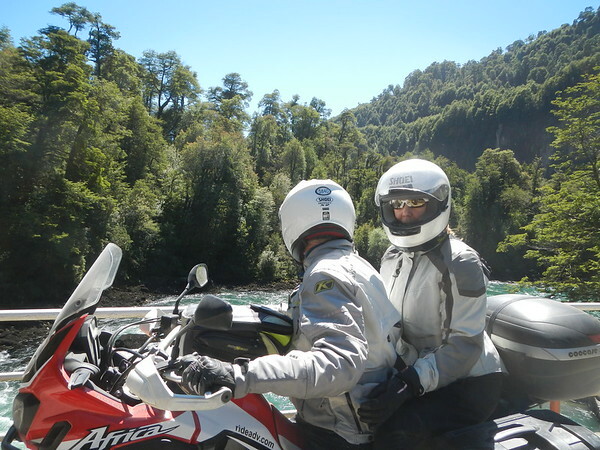 We rode into Bariloche and stopped with the bikes along the waterfront in the center of town. I pulled out my phone and the Booking.com app and located the closest hotel to where we randomly stopped. It was the Tres Reys hotel across the street. $75 USD, not a bad deal. 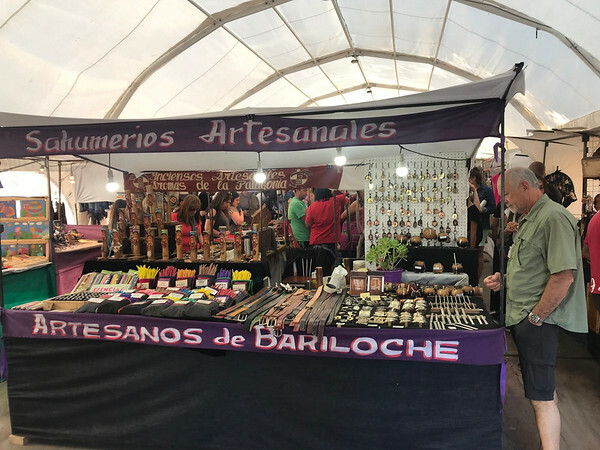 Bariloche is one of the biggest tourist towns in Argentina but we had never been there so we changed and walked about town. 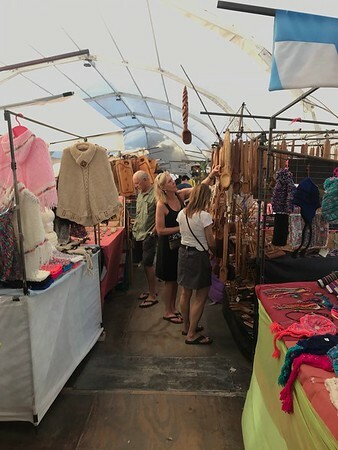 There was plenty of shopping opportunities. Yea, yea, touristy stuff. I wasn’t that impressed but we wandered until 9:30 when it was appropriate to seek a restaurant for dinner. Somehow we stumbled into a fantastic place where we got one of the last tables. By the time we were done it was late so we wandered back and called it a night. 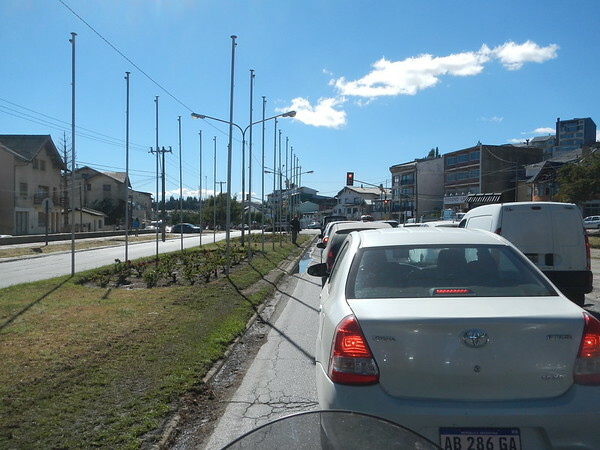 Bariloche is crowded. I wasn’t loving the traffic and was looking forward to getting out of town. 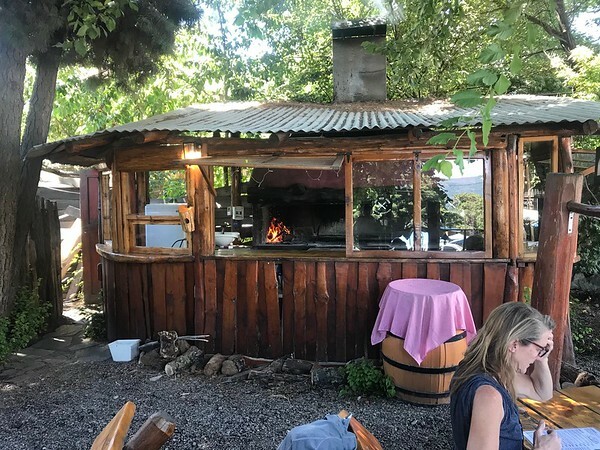 We eventually made it out and found our way north towards another touristy city, but one of my favorites, San Martin de los Andes. The route I picked was the famous Seven Lakes route. A beautiful section of twisty road through mountains and many lakes. 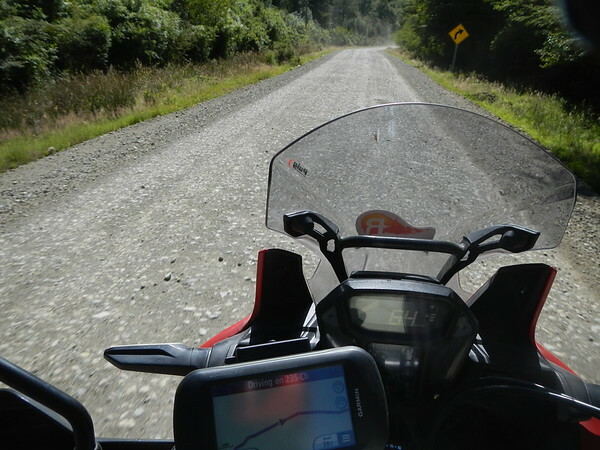 Deby and I had gone this way twice before, in 2016 and in 2013 on the original MotoRaid trip. Both times we loved it, not this time. The end of January was the peak of the tourist season and the word was out about the grandeur of this route. 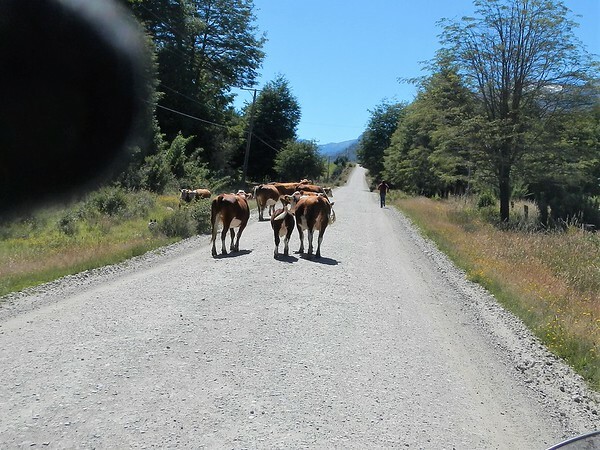 We spent all day passing, dodging and avoiding cars, trucks and more cars towing campers than I ever remembered seeing in Argentina. I don’t know, it wasn’t that much fun. Yes, day two of the pastries for the Casa de Te. 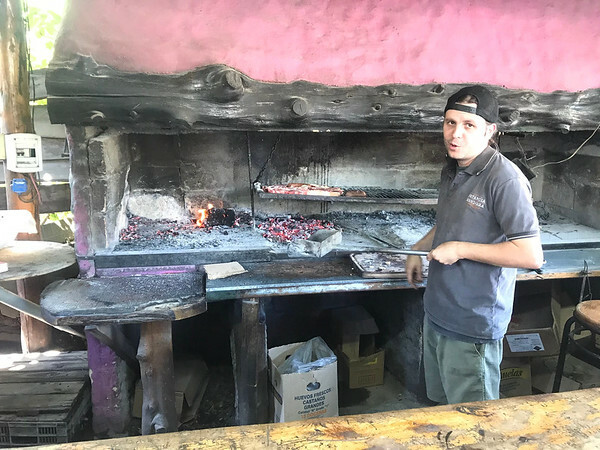 We arrived in San Martin and without reservations, took a chance on getting rooms at the Plaza Mayor Hosteria. This was a special place for us. 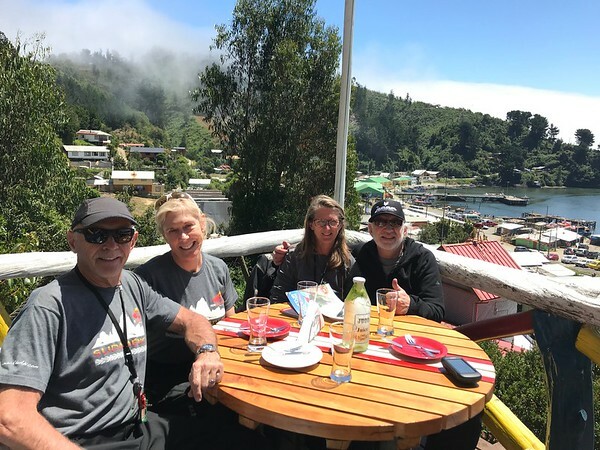 When Deby and I were there two years ago we needed to stay for a few days while we waited for a part for her motorcycle. The owners of Plaza Mayor, Mercedes and Able along with their son were very helpful with anything we needed and helped us getting the part when it finally arrived at the bus station. Able is a motorcycle rider and when we were there the first time proudly showed me his collection of motorcycles. I wasn’t sure they would remember us but they immediately did and gave us a warm welcome. Yes, they had two rooms left and before we knew it we were checked in and sitting by the pool with cool beers, on the house! 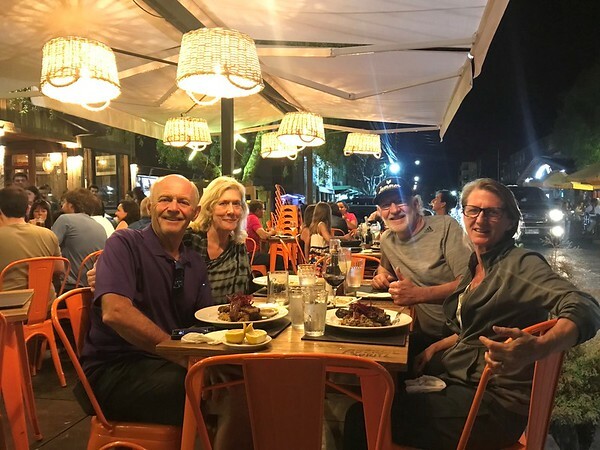 We spent the evening enjoying the much cooler vibe of this smaller tourist town and enjoyed music in the park, walking through the craft fair and another fantastic dinner. In the morning we said goodbye to our hosts. 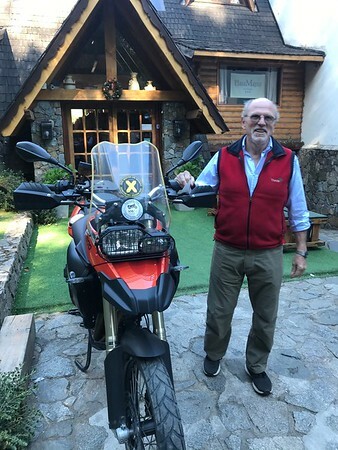 Abel brought out his BMW F800GS that he recently bought for us to admire. It is a perfect motorcycle, I know because I used to have one exactly like it, even the same year. 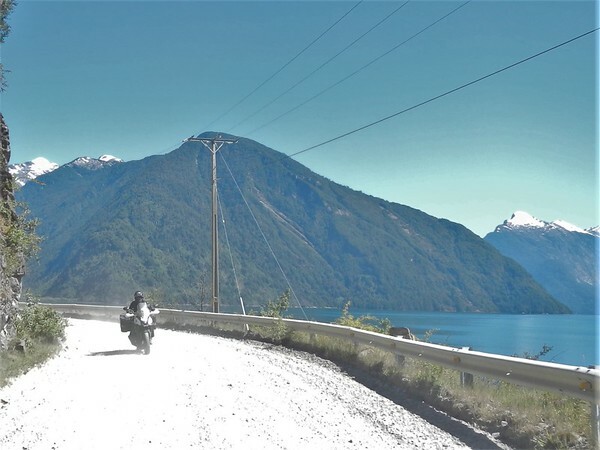 That was the motorcycle I rode from Seattle to South America in 2013. I gave Abel one our our stickers and he immediately stuck it onto his windscreen! A true place of honor, indeed I felt honored. We said our goodbyes and I took a picture of Abel, Mercedes and Deby. 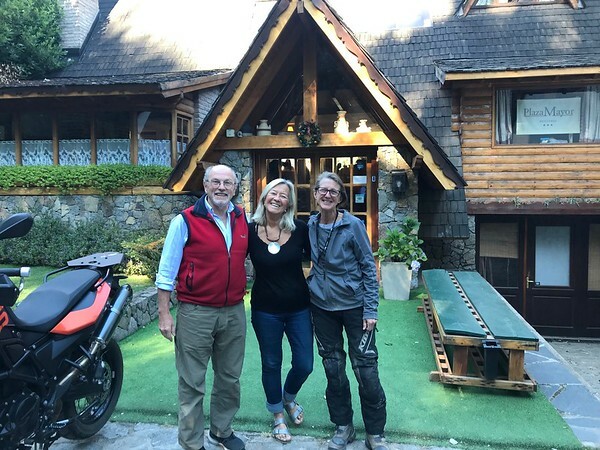 What great people and an excellent place to stay if you are ever in San Martin de los Andes. I’ll pause here. 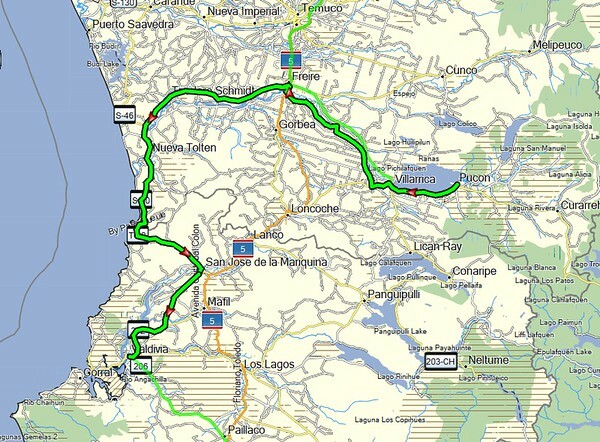 Here is the route so far and we only have a few more days before we have to send Dee Dee home and pick up Dr. Science. I’ll try to post more soon. 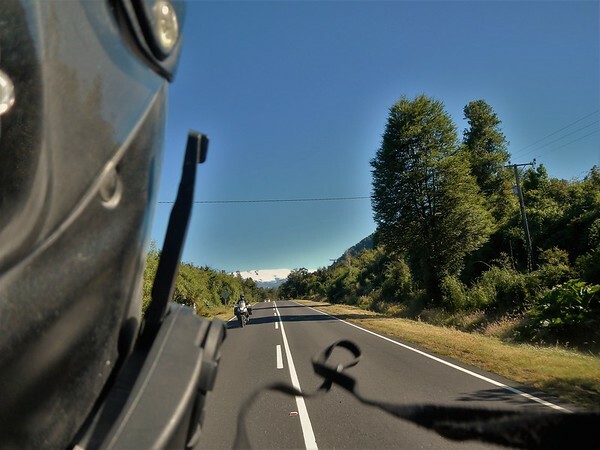 On our last trip to Patagonia we had to wait one month in Buenos Aires for our motorcycles to be delivered. This time…. one day! Oh, yea. Of course, we were not waiting for OUR bikes all we had to do was take a cab to the offices of Ride Adventures in Pucon where they had our bikes shined up and waiting. But first….. the trip down. Wow, it is a Looooooonnnnnggg Waaaaaay Doooooown. Deby and I arrived at the Seattle airport at 10:00 AM on Wednesday January 16 for a flight to Houston. 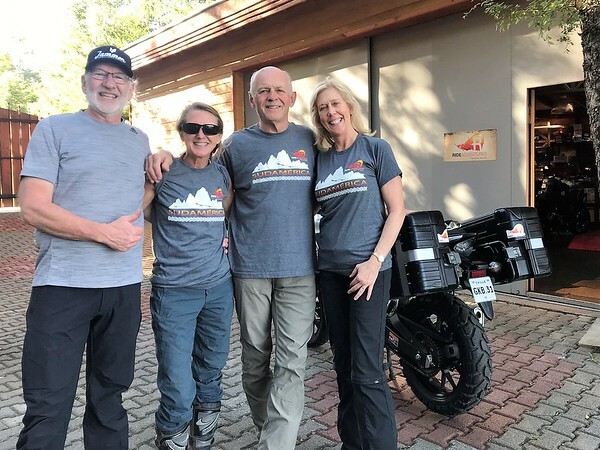 We arrived in Houston with just enough time to meet Michael and Dee Dee who flew from Idaho, drink a beer and jump on the all night plane to Santiago, Chile. From there we negotiated the organized chaos of retrieving our luggage (a lot of it) and getting through customs in time to make a local flight to Temuco, Chile. 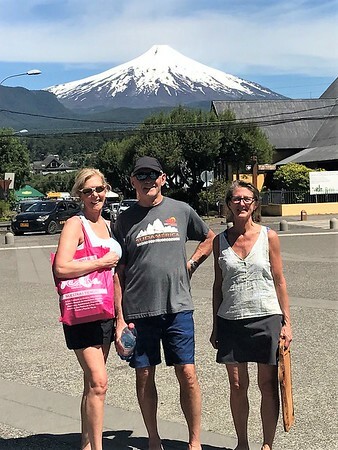 We landed in Temuco about 3:00 PM where we jumped on a shuttle van for an hour and a half ride to our Airbnb in Pucon. We arrived there about 5:00 PM on Thursday. So, how many hours was that travelling? How many hours sitting on planes? What ever that adds up to it was many many more hours than the number of sleep hours I had during that time. I could hardly sleep at all. 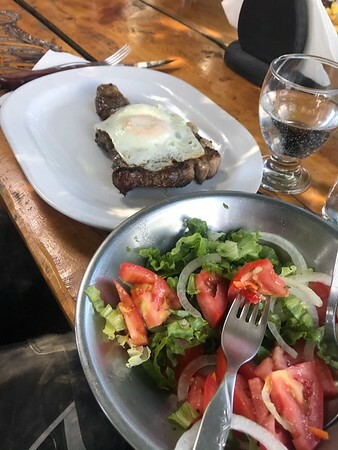 In Pucon we managed to stay awake enough to get a couple of beers and some food at a corner restaurant and crash at 10:00 PM local time. We made it. 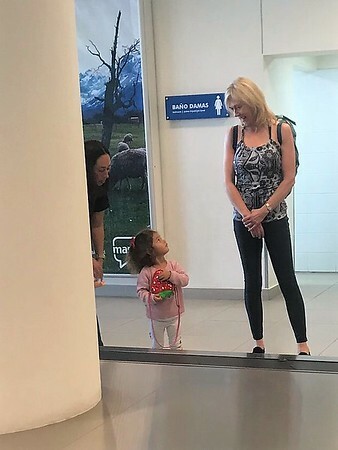 Dee Dee made a friend at the airport in Temuco. They really don’t see many tall women with blond hair around here. Friday was a day off. We spend the day being tourists walking around town and hanging out at the beach. 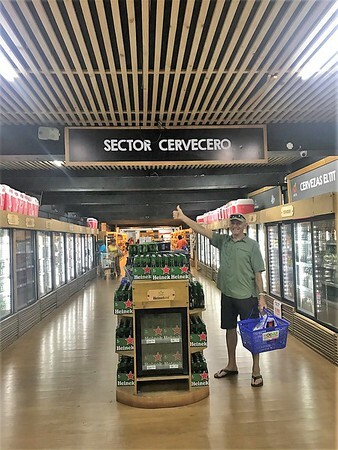 Michael’s first order of business was to find the beer. He’s a professional. We walked around town and took touristy pictures. 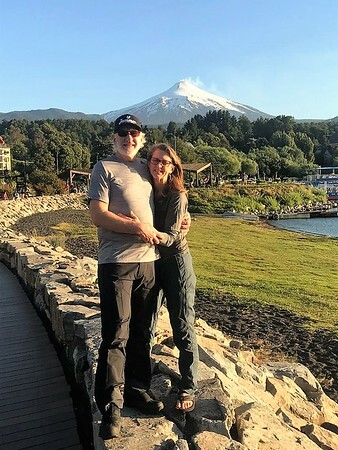 Here is Deby and I with Volcan Villarrica in the background. This volcano is always steaming and is the most active volcano in South America. We were told at night you can sometimes see a red glow at the top. 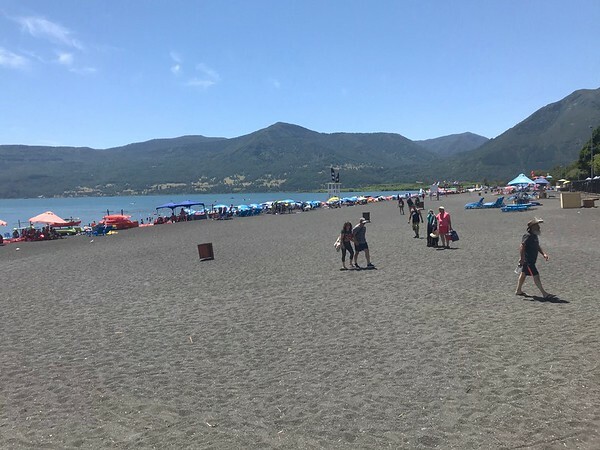 We went to check out the black sand beach along lago villarrica. 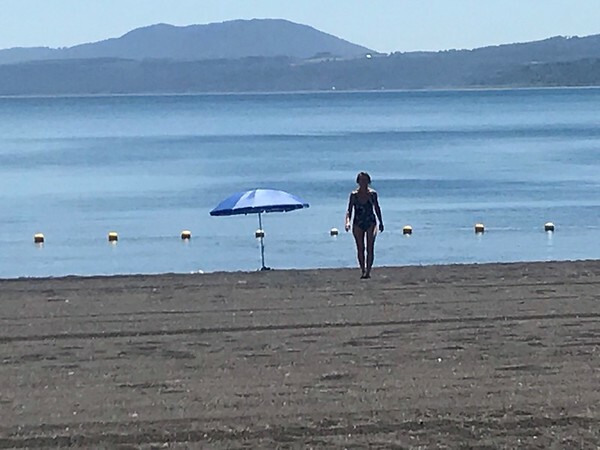 Deby went for a quick dip… it was really cold. It was an amazing day, the weather was perfect, about 90 degrees and lots of sun. It’s the peak of the summer season here so the city was crowded with vacationers. It seems like everyone was from Chile, we didn’t hear any English spoken at all. At 4:00 we took a cab to pick up the bikes about 20Km east of town. Here is where we first saw the motorcycles we would be on for the rest of the trip. Two Honda Africa Twins for me and Michael and a Honda 500x for Deby. 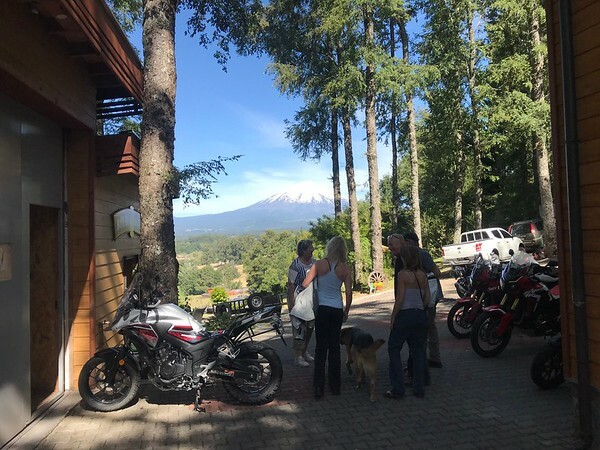 We couldn’t believe the beautiful location Ride Adventures has for their shop, wow, look at this view from the parking lot. It took a couple of hours to inspect the bikes, complete the paperwork and make some small adjustments. We then reviewed the route and Ulli, from Ride Adventures had some great alternate route suggestions. Thanks Ulli. Here we are, almost ready to ride! 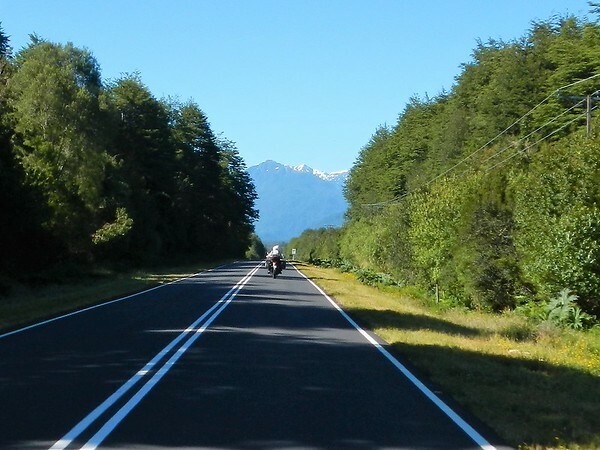 We managed to ride the 20Km back to Pucon with no incidents. Strange, bikes, strange city, lots of weekend traffic. Yes, we were on high alert but arrived safely by about 7:00 PM and tucked the bikes away safely in the secure underground parking of the Airbnb (muchas gracias Monica!). We poked around with some re-packing on the bikes but eventually needed to get out for a walk in the warm evening. 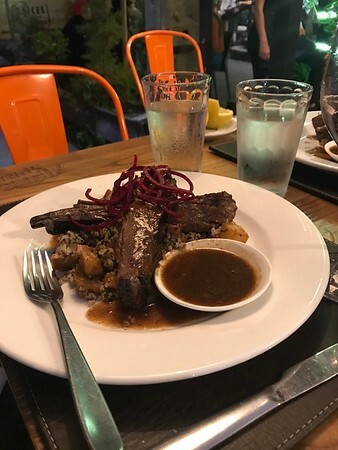 We ended up at a rather nice restaurant very close to the Airbnb and sat down for dinner at 10:00 PM which is definitely the appropriate time to arrive at a restaurant in Pucon. It was packed and we got one of the last tables right next to the road. Here is a page from the menus, I circled what I thought was interesting. For sure, you want to order off of this page if you want to Maintain Your Figure. But if you want real adventure in dining you want to order the “Tabla de Carnes.” There is a translation in English. If your wondering about the prices, they use a period instead of a comma to delineate thousands. 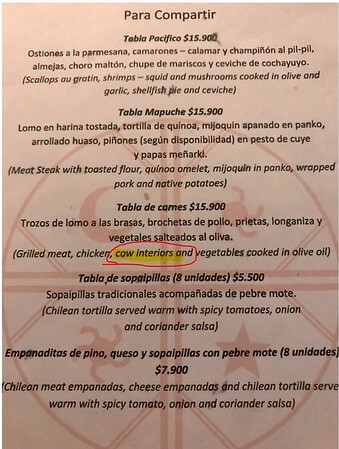 Tabla de carnes is $15,900. 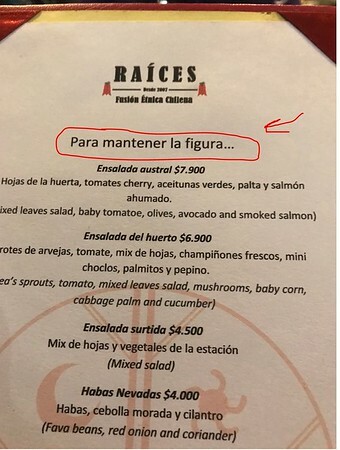 That’s pesos…. so around $20 USD. Here’s Deby’s plate, brazed brisket… she said it was really good. We had an outstanding night. The outdoor section was loud and boisterous. We were as loud and rowdy as the best of them. To add to the fun these drummers entertained the crowd from the street. Finally, at midnight the restaurant started thinning out. I had one last bit of business to take care of inside but needed to find the correct door for “men.” Let’s see…. oh yea, this must be it…..
With that we carefully walked the block to the Airbnb and called it a night. Hmmm, I didn’t take too many pictures. I was busy navigating (since I’m the one with the GPS) and getting used to the bike. We took off bright and early to beat the heat at 10:30 am. Oh, well, with the late night and packing the bikes I thought that was pretty good. Here was our route. 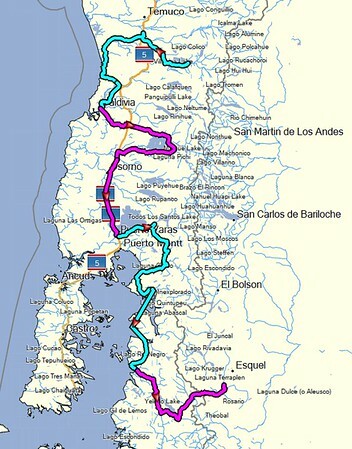 A total of 176 miles to Valdivia. 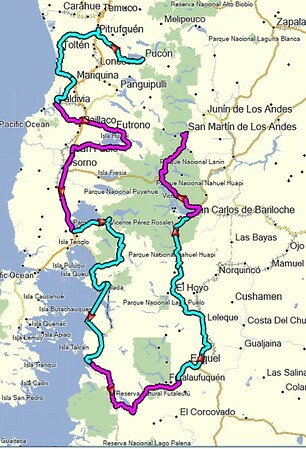 We took the long route recommended by Ulli which took us along the coast. The temperatures that were in the 90’s in Pucon dropped into the 60’s with fog as we neared the Pacific Ocean. I felt like we were descending into the fog of the Oregon coast which would make sense since we are at about the same latitude south as Oregon is north. Here is Deby with her Honda 500X, so far she really likes it. 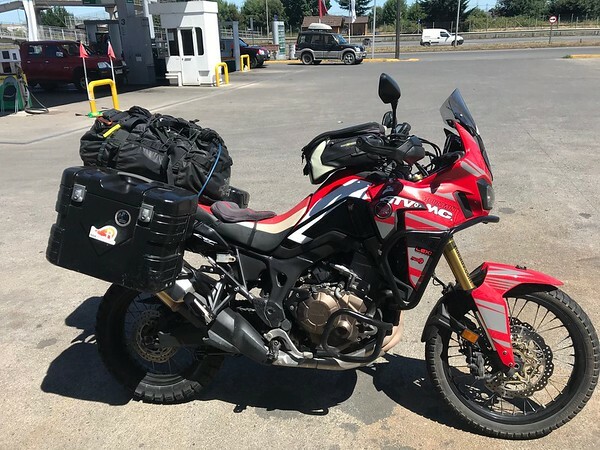 Below is my Honda Africa Twin, Michael and Dee Dee are two up on a bike just like it. We had a nice lunch stop at the Mobydick restaurant in the small port town of Queule Mehuin. 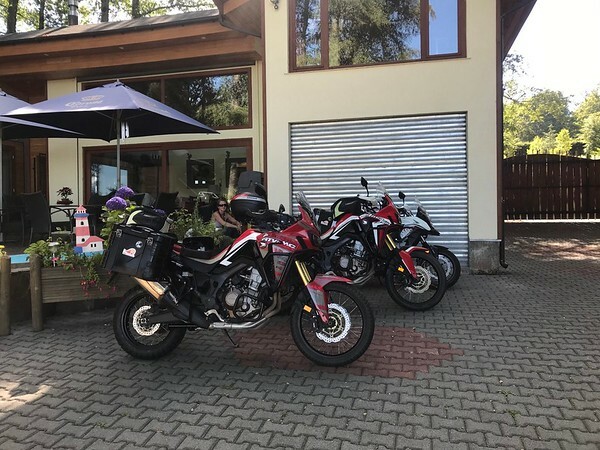 We ended up at the Hotel Entre Tilos in Valdivia. A real nice place, Deby and I stayed there last time we were here in 2017. It was a great wrap to a perfect first day of riding. So far so good. 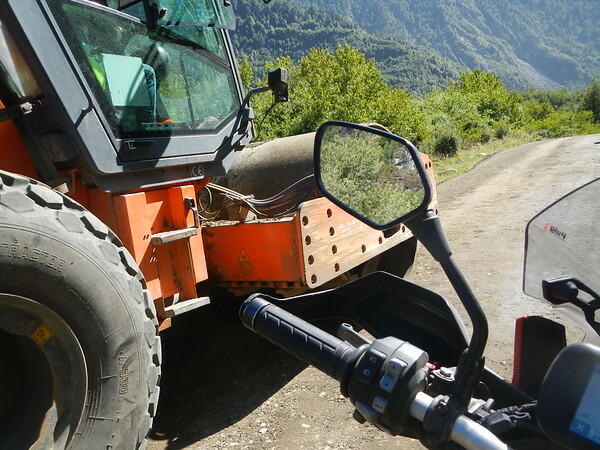 The bikes are working perfectly, the weather is ideal and the roads and scenery are beautiful. Ahhhh…. So here we go. I hope to post as often as possible. Remember you can click the “follow us” tab at the top to see our real time location. Thanks for all the comments, we love them. I want to answer them all but if I start I’ll be spending my evenings on my computer instead of out exploring this great part of the world.